I'm not sure how I got there, but one day whilst I was bouncing around the interwebs, I stumbled upon this blog post and thought "Now that's a great idea." I'm already in the habit of logging my runs and giving a little bit about how the run went or noting if something big may have affected by running but I've never done anything more than that. For ages this worked well for me, but after last year's less than stellar performances (compared to what I was hoping for and know I'm capable of) I've come to realise that in order to try and assess what went wrong last year, I need to read several hundred log entries. By introducing a weekly summary, I can easily summarise my week as I go, summarise my training for the week, note any major things like big nights out, huge Sunday roasts etc to see if and how they have an impact on my running. At the end of the year, I'll have at most 52 entries to read instead of hundreds. Unlike the referenced article, I'm putting it on my blog as there's nothing like public review for motivation. It's also because FetchEveryone and Strava don't really have the ability to do it within the log like TrainingPeaks does and I'm not a big enough fan of TrainingPeaks to switch away from Fetch or Strava or add it as another place to log my runs. So without further ado, here is my first ever "Week in Review" post. Looking back at the type of training I did in my best year - 2013 - and comparing it to last year, I realised I didn't do anywhere near the same level of base training nor as much MAF training. 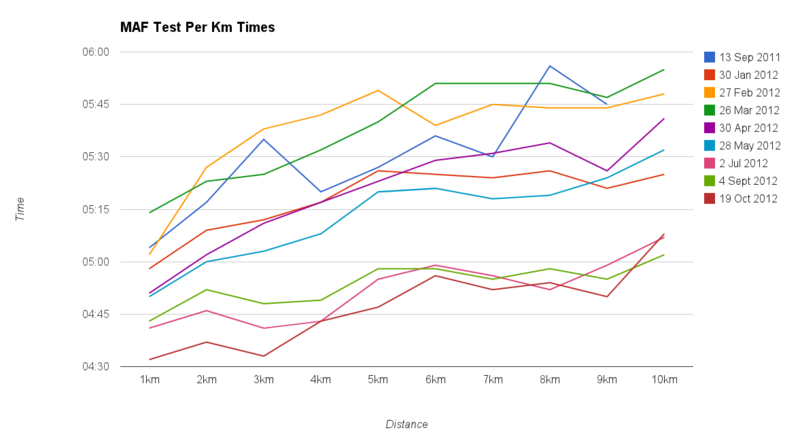 I wouldn't be surprised if the two heavy marathon training cycles following the Hansons Method I did had a big influence on my performances last year. On reflection, the Hansons Method worked really well for me in 2013, but only once I'd spent months running at MAF. Last year I didn't build this big base before hitting the programs so this year I'm changing it. I started the week off with a MAF test in a completely fasted state. I'm going back to performing a regular test, even when I start introducing more intensity, as a way to gauge how I'm progressing. There's nothing quite as inspiring as seeing a graph which proves you're getting better. This was a good run and a clear indicator that I'm no where near as fit as I was in my peak in 2013 - just the motivator I need. The rest of the week was spent running for at least an hour at MAF trying really hard not to get too bored - damn this is slow - and enjoy the easy running and catch up on my podcasts. On Thursday - new year's eve - FetchEveryone, Strava and Garmin Connect all proudly told me that there was no way on earth I'd be hitting the 3650km I'd targeted for the year and in retrospective, it was probably a bit silly of me to set a distance target. I think aiming for distance may have led to some of the fatigue I experienced last year which I put down to jetlag at the time. I definitely won't be aiming for distance this year. It was during Friday's run that I decided this year will be about sticking the an 80/20 aerobic/anaerobic split the elites apparently use - bye bye Hansons Marathon method - to see how it works for me. I finished off the week with a nice 2h15m long run at MAF. This really showed how unfit I am cardio-wise as I really struggled to keep within my MAF range once I passed the 1hr mark but I was good and walked when I needed to to bring my HR back down, especially up the steep hills.